alesso at close up forever summer party!!! It’ll be by your side." 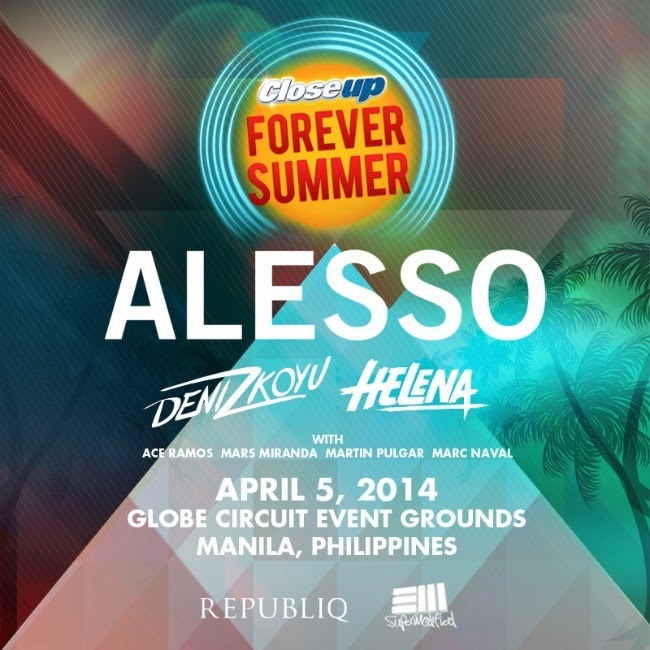 There was 7107, Malasimbo last weekend and now it's time to save the date once again for April 5, 2014 when Close Up Forever Summer rocks our world and takes Alesso to perform for all of us at the Circuit Grounds Makati!!!! Yes, the public has spoken. After months of planning and several polls with over 500,000 participants, Close Up finally announces the line up for this year's Close-Up Forever Summer Music Festival. This year's Forever Summer is gonna be a super fun and FRESH BEACH PARTY in the city at the Circuit Grounds Makati with foreign DJ's Alesso, Deniz Koyu, Helena, along with local DJ's Ace Ramos, Mars Miranda, Martin Pulgar and Marc Naval providing the soundtrack for an unforgettable day filled with music. I'm pumped and suuuuper excited! Make sure you don't miss out on this epic event, grab your tickets today at all SM Ticket Outlets. follow Closeup on Twitter at @CloseupPH. SVIP Table reservations are via Republiq at 0917-550-8888. Let’s get together to create the summer party to remember forever at Closeup Forever Summer – Create Your Own Summer Party. Stay closer for longer only with Closeup. by Charlie, MYX, Yellow Brick Media, and Manila Concert Scene.